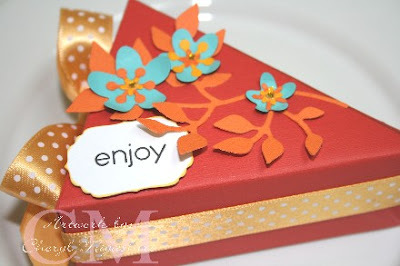 I was thrilled when I first found out that Sizzix was coming out with a pie box die to use with your Big Shot. It's a perfect size to fit all kinds of goodies. I used the new Sizzlit set, flowers, branch and leaves to decorate my box. Stamp is from Hero Arts from one of the ink & stamp sets and I used nesties label 4. 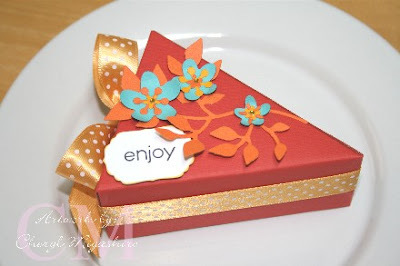 If you're going to make this pie box, use a stiffer, thicker cardstock so the pie box holds its shape. I used Worldwin doublemates cardstock. It's 2 cardstocks glued together and you're getting 2 different shades of color. I had no idea today was a state holiday. It seems so odd when it doesn't fall into the weekend. Early this morning we went walking at Ala Moana beach park and the parking was getting pretty tight. Well, thanks for stopping by today and hope you're enjoying all the sunshine we are having. Very pretty! That is one cute party favor, I like the colors you sued. This is cute! Love the look the ribbon gave to the box. Can't wait to get this die!! Another cute project and one more die to buy :0 This came out so cute! love the ribbon too! Very cute...the ribbon makes it look so elegant!!! What an adorable project! So cute for favors on table settings! Just too cute! Have a wonderful weekend and thanks for sharing this wonderful project!